For links to more language activities and resources, click on / Portuguese / in the menu at the top of this page. Explore a map of the EU and find out more about Portugal and other countries of the EU. Portuguese is Brazil's official language. Choose a category then point your mouse at an object to hear the word in Portuguese. 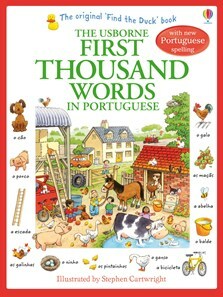 There are 1000 Portuguese words to learn in this classic word book, great for sharing with young language learners. Each busy scene features the wonderful illustrations of Stephen Cartwright, alongside items to spot, each labelled with their Portuguese name. A fun way to build key Portuguese vocubulary, specially revised and updated to celebrate the 40th anniversary of Usborne Publishing in 2013. Readers can listen to every word read by a native Portuguese speaker at the Usborne Quicklinks Website.